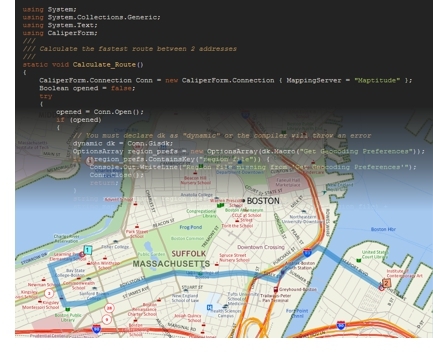 NEWTON, MASSACHUSETTS (USA) - Caliper Coproration has just updated the .NET APIs to allow developers to migrate MapPoint desktop applications and add-ons to Maptitude. Interactive maps generated by Maptitude, the popular Windows mapping technology, are crucial for businesses in a number of fields, including real estate, package delivery, and insurance. In a word, Maptitude provides businesses with "location." Specifically, it provides an integrated set of products and services to enable a business to track the precise location of remote assets, thereby reducing operational costs and improving productivity. Whether the asset is a truck, a taxi, or even a field rep, Maptitude can tell you the exact location at any time. Now it is easier than ever before to add all of the location intelligence functions of Maptitude, including routing and geocoding, into any Windows desktop application written in C# or any other .NET programming language. Maptitude has included the GISDK (Geographical Information Systems Developer Kit) for many years. With the updated GISDK .NET APIs, programming Maptitude in .NET has been simplified. Firstly, the GISDK Extension Engine API lets you extend the Maptitude desktop application itself by writing in-process extensions in C# or any other .NET language, without the need to learn a new programming language. Secondly, the GISDK Connection API lets you connect a new or existing .NET stand-alone Windows desktop application to Maptitude out-of-process. Either way, you can program Maptitude in .NET to build custom applications for the desktop, and analyze and share data generated from a wide range of maps, including those that show demographic trends, population density, and sales potential. Caliper is a privately held corporation and is a leading developer of mapping, redistricting, transportation, and GIS software. .